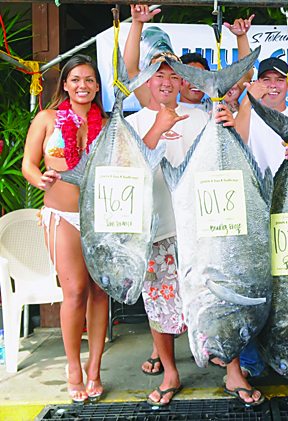 Bradley Erece Jr. was competing in the 2008 S. Tokunaga Store Ulua Challenge and decided to camp near Kalapana on the Big Island. Eventually, he hooked his 101.8-lb monster ulua and battled it usuing his 13-foot Talon rod, Newell S646 reel and 80-lb test Stren line. The huge fish earned him third place honors in the tournament.